I actually wanted to show you some things I made so far this year but then I stumbled upon Ginny’s blog Small Things and her Yarn Along Post, asking other people what they are knitting and reading (check them out too, there are some cool things that other people are doing) this week so I thought I start with telling you what I’m doing this week and what I’m reading meanwhile. A sweater vest for my boyfriend made from a dark blue merino wool, polyamid mix, a simple model for which I finished the back yesterday and started with the front part. It shouldn’t take that long. I need about 1,5 weeks for the back. But I hope the whole thing fits. I have never knitted something for someone with another size than me before. If not, well than it is back from scratch, I guess. Knee high thick socks from mustard coloured wool with little colourful pieces where I just finished the heel of the first one. 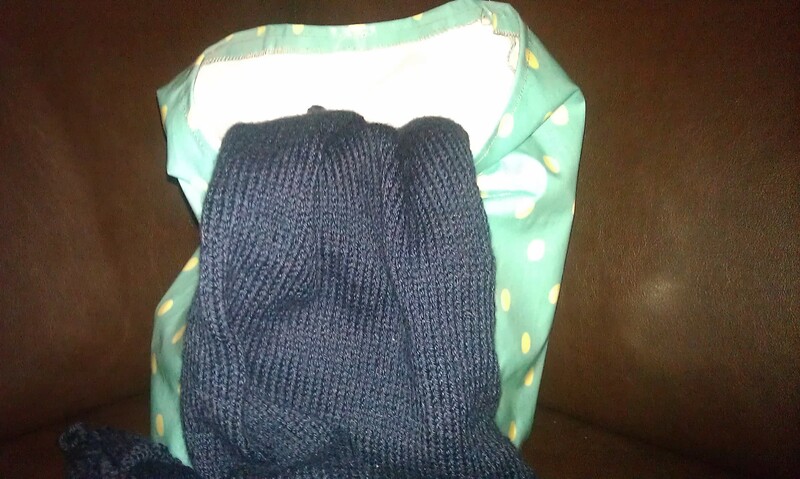 I have anoter cool sock wool for another waiting as well. And as usual I do felted slippers (just finished this year’s new pair for my boyfriend, the brown ones on the left). The new ones are for a friend of mine who asked for a special form with a higher ankle part which I still have to figure out how to do them best. 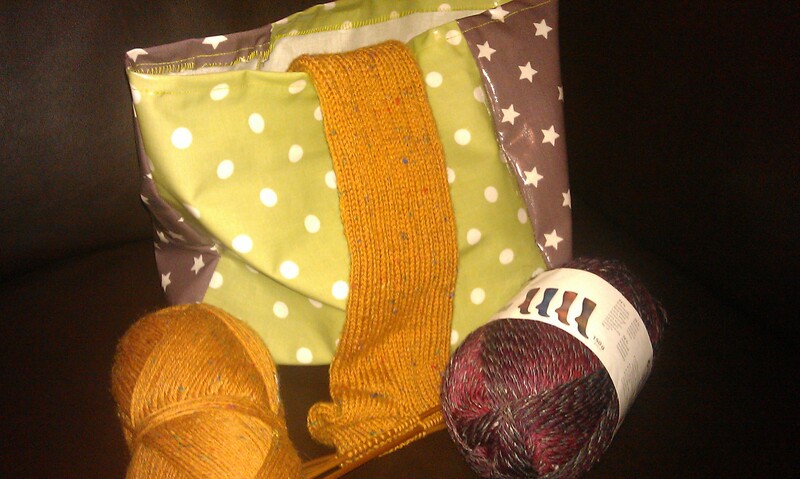 And ignoring the fact that I already have wool to keep me going for quite some time, I bought new one for a sweater. I want the sweater to look a bit retro, 50s style so I guess stripes won’t work that well, but a argyle style could be an idea. 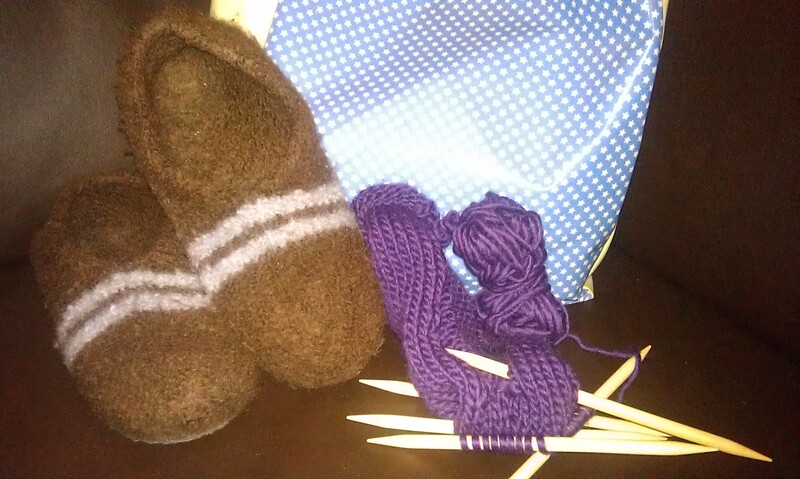 But I will only start it, when I’ve either finished the sweater vest or the slippers and the socks. Hope I can finish the slippers and maybe even the socks at the weekend so I can start with the new sweater..And I complete forgot that I had ordered some more so I got a box with recotton today. I am reading “A Storm of Swords” the third book in the series of “A Song of Ice and Fire” by George R. R. Martin. 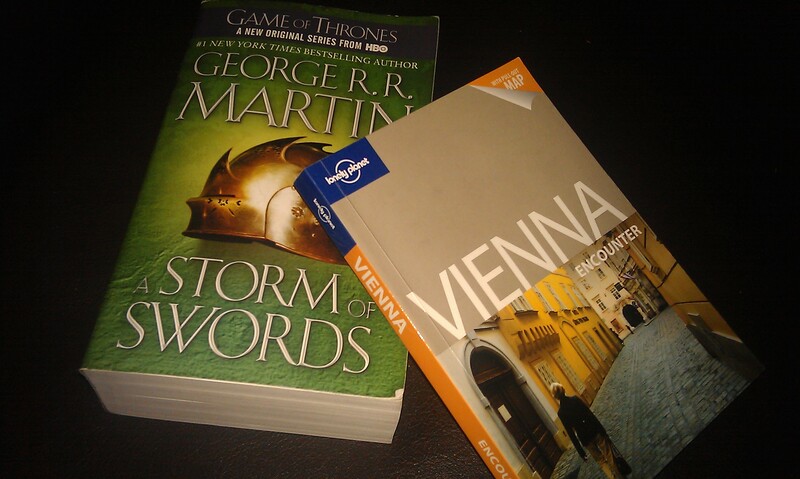 I think the story is very exciting and everything, yet it streches and streches and streches and I fall asleep at night in bed after just one chapter so don’t get far.And I’m trying to figure out what to do in Vienna next week, so one of the small Lonely Planet guides is on my list as well. 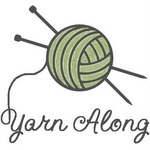 This entry was posted in Knitting & Crocheting and tagged Knitting, Lonely Planet, Slippers, Socks, Sweater vest, Yarn Along by kathatravelling. Bookmark the permalink. Is there an English equivalent to the ReCotton website? Love the Vest and the mustard socks. Recotton sounds very interesting, never heard of it before. Am also reading The Game of Thrones, am only on book one though, and honestly am struggling to get into the story right now, I hope it will get better! You just got back from Sydney and are headed to Vienna? ♥ Lucky you!!! 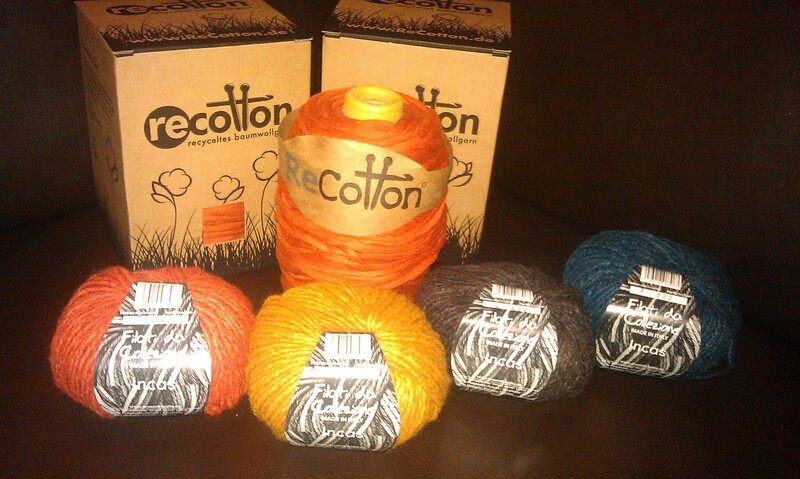 Where did you get the REcotton yarn? Is it made from recycled items? No, I’ve been to Sydney in 2007 (studied there) but yes, I’m going to Vienna next weekend. Really looking forward to it. I got the recotton from Wollfactory.de ( http://www.wollfactory.de/next/next-recotton—recyceltes-baumwollgarn/index.php?gclid=COKr9PLU2LICFYTMtAodQT4A-Q) and it is made from scraps of textile productions, recycled or rather used at all items 🙂 I’m really looking forward to working with it. i love those knee high mustard socks! love them. and all your yarn, so lovely!